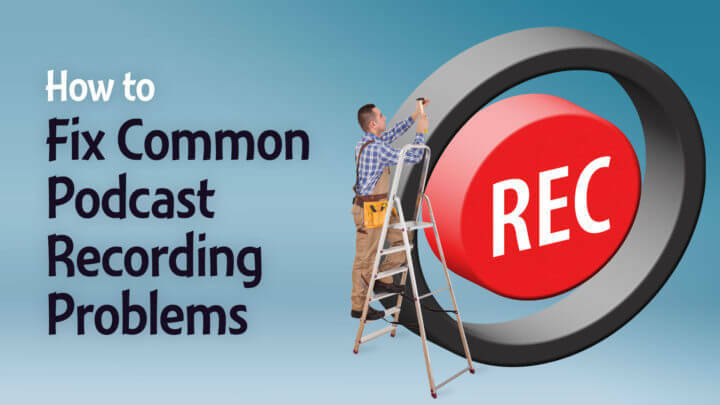 Recording problems can result in noisy, corrupted, or missing audio. Test before anything important! Here are solutions to these common podcasting problems. Whether through software or hardware, there's a chance you're not recording everything you think you are. Here are some things to check. Can your tool record what you want? I've seen a lot of podcasters think recording Skype calls was as simple as using Audacity, but it's not. Whether you're using hardware or software, ensure that it can even do what you want it to do with the tools you have. Is everything properly connected? Cables might be loose or not connected, or apps might not be running. Is everything on? Power, mute, volume, and more could be simple switches or knobs that might not be in their right place. Are signals properly routed? Trace the cables and audio processing chain to ensure everything is going where it should be. On the software side, ensure that your apps are looking at the right devices for inputs and outputs. It's horrible to record audio only to discover it's completely unusable due to corruption. Here are some things to check. Quit as many background apps and processes as possible and don't run anything resource-intensive. Unplug and reconnect digital audio interfaces. Keep enough free space on recording devices. Ensure your input levels aren't too high. Unwanted noise comes in many forms. You may be able to remove it with software, but it's best to remove it before you record. Here are some things to check. Ambient background noise: turn off what's making noise, move away from it, put things between your mic and the noise, and point your mic away from it. Constant hiss (not background noise from your environment): get closer to the mic (about a fist-width away), use quality equipment, and don't let low-quality gear handle the audio amplification. Humming, buzzing, or strange interference: keep audio cables away from power cables, plug everything that's connected to each other into the same surge protector, use a ground-loop isolator, use a HumX, move equipment farther away from each other, and invest in quality gear (including cables). If the audio is too loud, it will clip and distort. If it's too quiet, then you may introduce more noise when you amplify the audio. Here are some ways to ensure consistent volume levels. Learn good microphone technique: stay a consistent distance from the microphone, but move farther away when you get louder. Watch volume meters when testing different sources: have each host or sound source come through one at a time and ensure they average the same volume range. Record test audio for review: it's hard to mix your own voice with others' in real time. A recording will let you see and hear the actual differences to tweak. Listen instead of looking: loudness is more than the visual waveform (although it is generally a good representation). A highly compressed signal may look quieter than an uncompressed signal, but it could still be louder. Use proper measuring tools: use a LUFS-measurement tool, such as r128x-GUI for OS X, Orban Loudness Meter for Windows, or the measuring tools in professional software to get actual numbers. These are integrated loudness (measured in LUFS), loudness range (LRA), and true peak (dBTP). Ideal targets are -19 (mono) / -16 (stereo) LUFS, under 4 LU LRA, and -1.0 or lower dBTP. Podcasters' Society opens to new members on July 1. Join the waiting list for a special bonus! I'm taking a sabbatical in June 1 through July 15, 2016. I'll still have publish podcast episodes and my weekly email newsletter, but I'll be available only to members of Podcasters' Society. All emails, voicemails, and other comments during that time will be automatically archived and will not be responded to unless you email again after July 15. What is the source and basis of your “under 4 LU” LRA (Loudness Range) recommendation? Hey Daniel, Thanks for another great show! I have not been happy with some mouth clicking noises I sometimes get. I experimented a bit this past week. I confess, I am podcasting on the cheap, but having fun! I record using BossJock Studio, USB Dual Pre, Audio Technica 2100, and Macbook Air. Although it takes a bit longer, I did the following for my podcast that came out this morning on twocjs.com . I exported my recording from BossJock to my mac as normal, as a wav file. Ran that through Levelator. I then put that into iMovie and set the noise reduction to 100%, along with a Bass Boost. I exported the audio file back to my mac as Mp3. I then put that into Garage Band for final editing, using my normal EQ and compression settings. I set the noise gate to 30. I was happy with the tests this week, and happy with my podcast, “All About My Catholic Faith”, this week as well. Yup. That’s part of turning off noise makers. Sometimes, we have to be a little uncomfortable for our art.